When I first saw the package for “Standing with Stones: A Journey Through Megalithic Britain” I thought, whatever, yet another thing about Stonehenge. I can’t tell you how glad I am that I still opted to pop it into my DVD player. “Standing with Stones” dedicates possibly one full minute to Stonehenge and nothing more. So what the heck does writer/presenter Rupert Soskin talk about for a little over two hours? Everything else, and if there is one thing you take away from this film is that there is a whole lot of everything else. Soskin leads you on a picturesque tour that covers England, Wales, Ireland, Isle of Man, and Scotland, revealing the treasure trove of stone circles, cairns, standing stones, and more that exist relatively unnoticed by modern society. Soskin makes for a charming tour guide. He displays a whimsical, mischievous nature, nearly delighting in the unsolvable puzzle that these ancient sites present. Other times he cuts through your inclination to get caught up in a perceived spirituality of the sites with insightful, practical observations. Producer/Director/Cameraman Michael Bott captures the beauty of the land wonderfully. Sweeping shots of majestic landscapes are broken up with amusingly framed scenes of impressive stone displays being frequented by live stock. “Standing with Stones” is a beautiful, thoughtful examination of all the ancient stone sites that Britain and its surrounding environs have to offer. 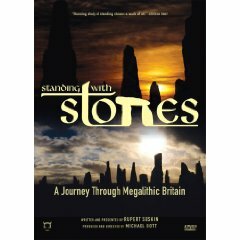 This film is a must for anyone interested in Britain’s countryside because “Standing with Stones” is a beautiful travelogue. Also, anyone whose spiritual practices are linked to ancient Britain will find this a useful film to watch to get insights into what their spiritual ancestors lives may have been like, including a wonderful segment dedicated to ancient Druids. Although not a summer movie blockbuster, no explosions or alien invaders here, I did find “Standing with Stones” and a nice glass of wine to be an enjoyable way to spend an evening. You can purchase “Standing with Stones” at Amazon.com, Disinfo.com, and iTunes.